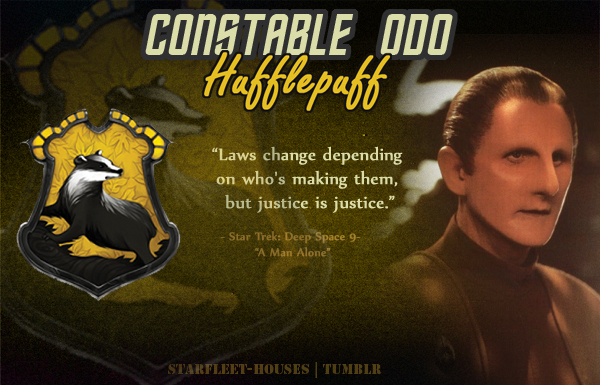 Odo - Hufflepuff. he pursuit of truth and justice is his central goal, and he is steadfastly loyal to the lawmakers. Even though those lawmakers may change, Odo remains steadfastly loyal to those who command him. He’s very grounded in his grouchy, and misanthropic ways. Wallpaper and background images in the nyota Trek: Deep Space Nine club tagged: deep space nine star trek ds9 fan art odo rene auberjonois changelings trek meets hogwarts hufflepuff. A Hufflepuff? I don't think so. EDIT: Okay, I've been thinking about this. Ready? Here we go.